It's -10. Let's turn up the heat for the nudes, shall we? Heh-heh: I read that as (seriously!) "let's turn up the heat WITH the nudes"!!! Who created the first pic? Esp. like the Koppitz, also the Ritz. while it's in the 70's here, I still love your nudes. and by the way, is that the lovely gina on the sidebar with the bride? :) if so, you are both beautiful! And the Ritz - like Linda, I love the hair. And I think the artist was inspired to create this image by the way the root echoes the figure's pose. 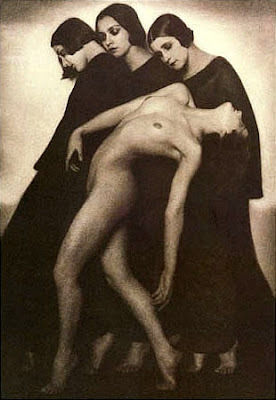 I would love to have a chance to draw the model in the Koppitz - a dancer, I bet. That is a magnificent image - and even the bare ankles of the supporting figures, seen at the bottom of the photo, are important elements in the balance. Pagan - thanks so much for sharing these! Now I've got to go look at your Sol LeWitt post! The 3rd one down should be titled "Embrace". Yes,the one snuggled into the tree is really something. JCF: ;-) I'm afraid I don't know who created that Olympia spoof. I went kind of wild gathering new photos of nudes and the photographer of that one escaped me. I'm glad the nudes warmed you up! Steve: the Man Ray is my favorite. Perhaps because if you look at it enough, you see different things in it. It's just such an original picture. I'm maybe less fond of his paintings but I sometimes change my mind about an artist when I really explore all of the work, seem some up-close and personal and become more acquainted with how the artist perceives his/her own work. Maybe a Man Ray Artist of the Week? Kenju: very good! It does appear that the tree is holding the model in its ancient arms. Bobbie: It is a gorgeous photograph. I have to look for others by Ritz. Betmo: Thanks, Bet! I always look forward the comments for the Friday nudes, including yours! Peace and love to all of you - among my favorite people on the blogs! Hugs. the koppitz one is somewhere on my blog. nice choices ! Sherry: I love that Koppitz picture. Such a classic. I would like the first photo better were it not for the ball of whatever the man is holding out to the model. I like the rest of it. ManRay always did make me laugh. Too bad more artists don't employ humor in their work. Libhom: actually, a lot of contemporary art often does the same for me. Whether it be because it's whimsical or because it's ridiculous. I LOVE that ManRay photo. I've been saving it for just the right night of nudes.